IBM and Apple have added another eight enterprise apps to their iPhone and iPad range that includes healthcare and industrial products for the first time. 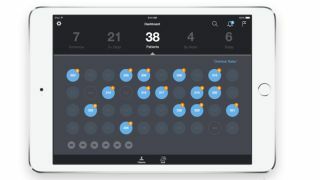 The new apps, which are fruits of the MobileFirst for iOS partnership signed in July, were first reported by 9to5Mac and bring the grand total of enterprise apps designed specifically for iOS to 22. IBM's first four healthcare apps are also joined by the debut industrial products offering as well as one app each for the travel and transportation, retail, and insurance industry categories. Hospital RN for iPhone lets nurses access patient records from any location in a hospital by using Apple iBeacon technology. Hospital Lead for iPad assists charge nurses in the art of effective ward management, and they can assign tasks with a tap of the screen. Hospital Tech for iPhone enables nurse technicians to keep a close eye on care teams and make sure tasks are completed quickly and safely. Home RN for iPhone facilitates better care outside the four walls of the hospital by allowing nurses to add extra detail to patient files in the form of photos, video, audio or text notes. Rapid Handover for iPad (Industrial Products) provides a unified interface for a factory foreperson to document and share information with incoming shift members in the form of production goals, equipment maintenance, crew lists and a lot more besides. Ancillary Sale for iPhone (Travel and Transportation) is designed specifically for flight attendants to harness a higher level of control over in-flight purchases thus allowing passengers to buy upgrades, food and refreshments, and duty free merchandise using Apple Pay or a credit card whilst in the air. Order Commit for iPad (Retail Industry) makes it simple for retailers to plan for the best product assortment possible by allowing quick access to sales metrics and financial forecasts on individual products. Risk Inspect for iPad (Insurance Industry) makes insurance assessments a doddle by using the camera and videos to capture details that mean repeat visits to locations aren't required. The first list of 10 apps was unveiled back in December shortly after the two announced a new support service known as AppleCare for Enterprise offering round-the-clock support for Apple hardware and operating systems.